University Quarter in the Krakow Old Town comprises the oldest buildings and collages of the Jagiellonian University. All of them are located in close neighbourhood to each other and are still in use today. The most significant points of the University Quarter are: Collegium Maius, Professors’ Garden and Collegium Novum. 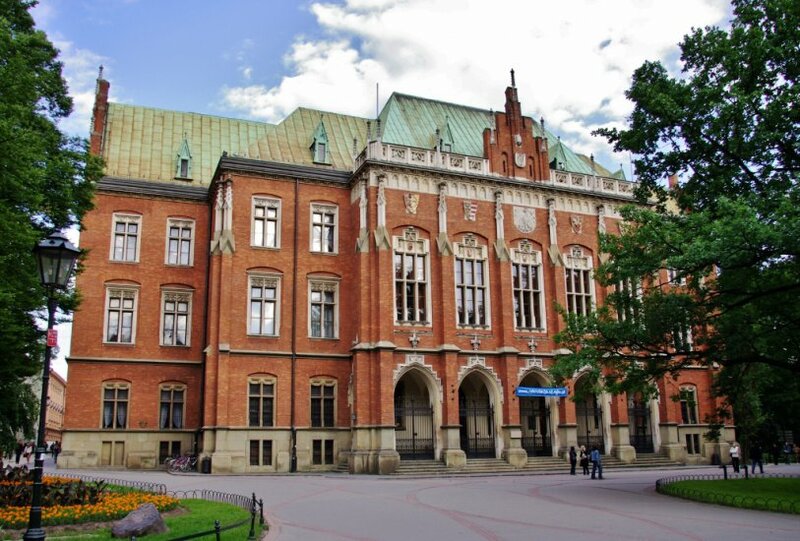 Jagiellonian University was established in 1364 and founded by king Casimir III the Great. In 1400, king Wladyslaw II Jagiello, thanks to a large contribution of his recently late wife, queen Jadwiga, purchased a house on the corner of today’s St. Anne and Jagiellonska Streets. In the next years, the house was rebuilt into a magnificent late-Gothic collage, Collegium Maius. It was the first building of the University. Around the beautiful arcaded courtyard were located low-vaulted, long lecture halls. The first floor was occupied by Professors’ Common Room, Library and Auditorium. On the first and second floor were situated professors’ dwellings. Students that could not afford a lodging somewhere in town, were also living in Collegium Maius. They helped with everyday chores for board and lodging. In 1490s, Nicolaus Copernicus studied at the University. 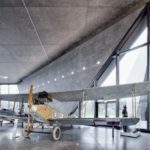 Instruments that he used during his studies can today be admired in one of the rooms of the Jagiellonian University Museum. The building of Collegium Maius was turned into a museum in 1947. 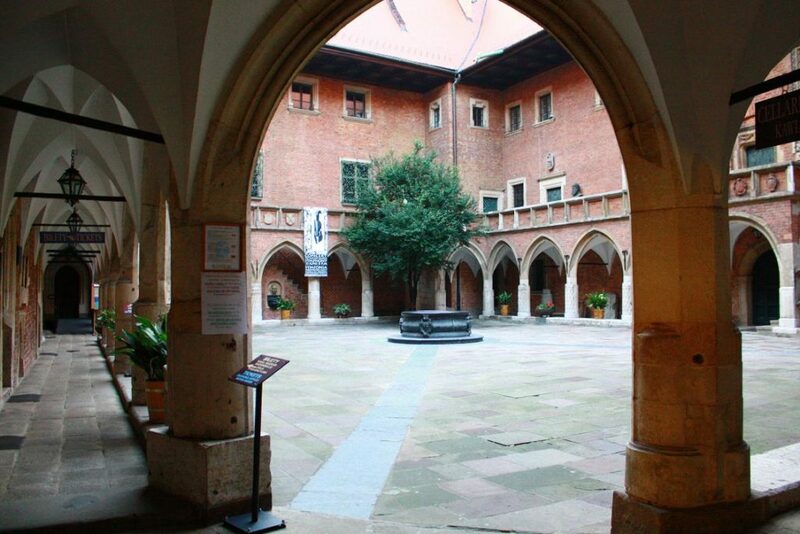 It is focused on the history of the Jagiellonian University. Neighbouring to Collegium Maius is the Professors’ Garden. It was first mentioned in 1467 and until the end of 18th century, it served for the University professors as a place to relax. They also took care of the Garden and many fruits and vegetables grew there. Professors’ Garden was left neglected throughout the 19th century and at the beginning of the 20th century, as a large part of the Garden annexed to erect new collages. Today, Professors’ Garden is surrounded by buildings of the Jagiellonian University. 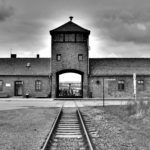 It had been revitalised in the last years. It is now a beautiful, quiet enclave in the heart of the Old Town. Garden’s greenery was carefully picked, paved alleys were made and even a small space for herbs and fruits was created. 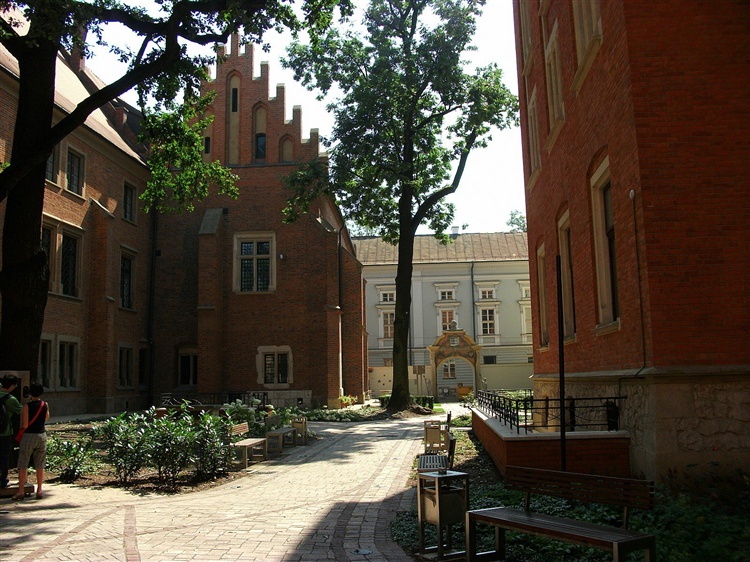 Professors’ Garden is accessible trough the gate on 17 Jagiellonska Street and the so-called ‘Long Hallway’ that connects the Garden with the courtyard of Collegium Maius. The Garden is used by students and staff between lectures and is also a popular spot among tourists looking for a little break from the din of the Old Town. At the end of 19th century, Jagiellonian University undertake a series of plans to erect new premises. In a short distance from the Professors’ Garden, around streets Golebia, Jagiellonska and St. Anne, several new collages were built. The most important and the most beautiful is Collegium Novum, built in 1887 as the new main building of the University. Collegium Novum is now the seat of the rector of the Jagiellonian University. In front of Witkowski Collegium, neighbouring with Collegium Novum, stands the monument of the greatest alumni of the Jagiellonian University, Nicolaus Copernicus. The monument was erected for the 500th anniversary of founding of the Univeristy and initially was placed in the centre of the courtyard of Collegium Maius.